Theodore "Teddy" Roosevelt was the 26th President of the United States and one of the most popular. Born in 1858, Roosevelt grew up in a wealthy family and suffered from asthma at an early age; in contrast to his weak physical condition, young Teddy devoted his childhood to books and learning, particularly the subject of nature. His strength in school led him to Harvard, where he improved his physique through boxing and other sports. Roosevelt also enjoyed writing and finished his first of 18 books at the age of 24; around the same time, his budding political career grew when he became a State Assemblyman. During the same decade, his first marriage ended abruptly after his wife, Alice, died of kidney failure...and to make matters worse, his mother died of typhoid fever on the same day in the same house. After spending several years in North Dakota as a cowboy and deputy sheriff, Roosevelt remarried and returned to politics as a member of the U.S. Civil Service Commission. 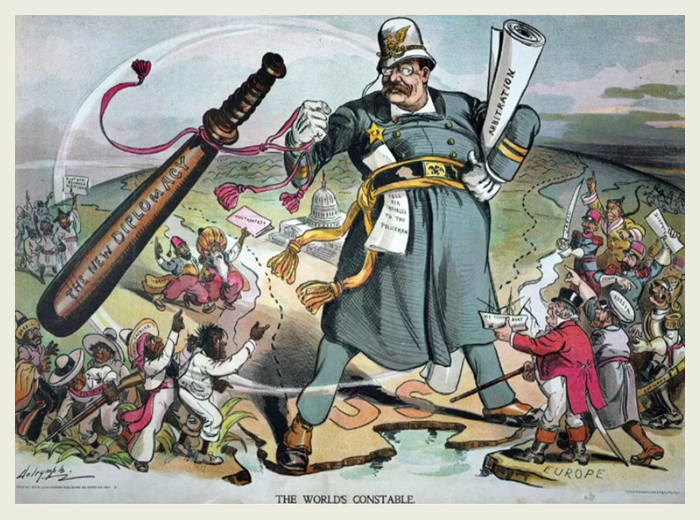 Less than ten years later, he was elected president of the board of New York City Police Commissioners, though he left to spend several years in the military (where he formed the First U.S. Volunteer Cavalry Regiment, AKA "The Rough Riders"). Following his service, Roosevelt returned to New York in 1898 and successfully ran for Governor; three years later, he would be elected Vice President of the United States. That same year, President William McKinley was assassinated and Roosevelt succeeded him as President, where he enjoyed two terms as a highly successful and influential leader. 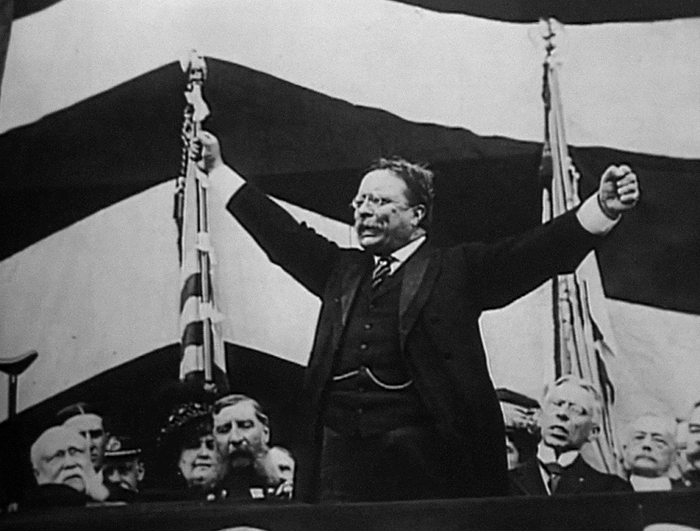 As the youngest President in American history, Roosevelt's charisma and strong presence were as highly regarded as his reformist policies and progressive stance. He gave members of the press a liberal amount of access to the White House for interviews and photo opportunities, while working tirelessly to narrow gaps between labor and business -- a policy he famously nicknamed "The Square Deal" -- and devoting time to women's and civil rights. Due to his lifelong appreciation of nature, Roosevelt also created the United States Forest Service, which included 5 National Parks and 18 brand-new National Monuments. 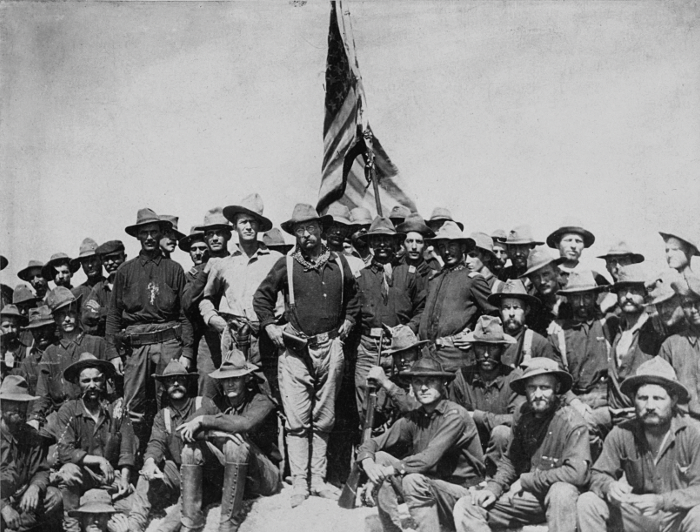 After the end of his second term, Roosevelt formed a new political party, spoke for 90 minutes after being shot in the chest, and spent a year in the wilderness of South America. He died of a heart attack in January 1919, leaving behind six children and his second wife. Researched, developed, and filmed during the better part of a decade, Harrison Engle's The Indomitable Teddy Roosevelt (1986) pays tribute to the popular President by touching upon many accomplishments in moderate detail. Roosevelt was the first American President to stand in front of a movie camera, so it's no wonder that a great deal of silent footage was available to help tell the story. Most of this footage is strictly promotional rather than candid; more often than not, T.R. stands heroically in front of massive, swooning crowds...and as amazing as that is to see, it can't fill in all the blanks. During production, Engle made the choice to supplement this footage with careful reenactments; this was a controversial and relatively new concept at the time, but it certainly proved to be a sound decision. Bob Boyd's portrayal of Roosevelt is fine casting, even if it sounds strange to hear vocals during these silent film-era scenes---and in some cases, actual descendants of T.R. are used to portray their late relatives (for example, Theodore Roosevelt V plays his great-granduncle, Quentin). Though first-time viewers may be distracted at first, the juxtaposition of historical footage and modern reenactments becomes almost seamless as the story unfolds. What's slightly more distracting -- whether it's your first viewing or your tenth -- is the film's soundtrack, which features music by famed composer/conductor John Philip Sousa. While this upbeat, patriotic score attempts to keep the mood energetic and lively from start to finish, it becomes a little tiresome after 96 minutes. This could be due to the audio mix; on almost every occasion, the music is louder than it needs to be and often does battle with George C. Scott's authoritative narration. It's a problem that was likely worse on prior releases and still somewhat obvious, but likely baked into the source material. The Indomitable Teddy Roosevelt was previously released on DVD by Infinity Entertainment back in 2010 (Review #1 | Review #2); before that, it was only available in Region 1 as a 1999 VHS release. I'm a bit surprised to see it surface on Blu-ray less than eight years later -- the re-enactment footage was shot on video for broadcast TV, and almost everything else is comprised of film clips and photos at least a century old. The other caveat is that it's a "manufactured-on-demand release" -- burned onto a BD-R disc, rather than pressed -- so all but the film's most die-hard fans should probably proceed with caution. 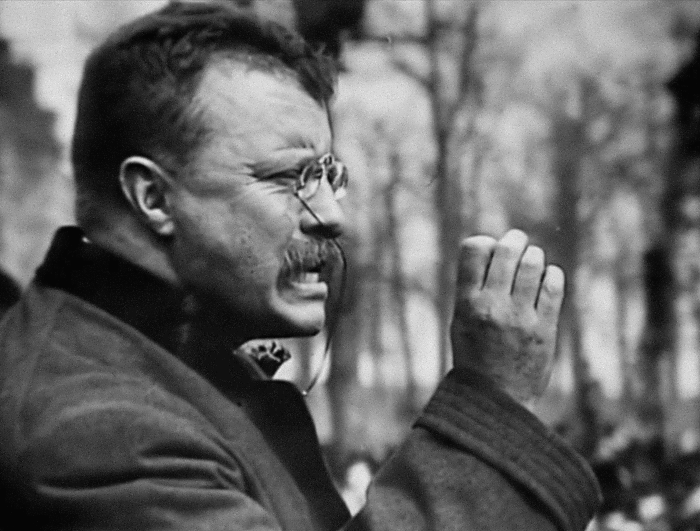 Advertised as being "newly restored and remastered", The Indomitable Teddy Roosevelt is presented in its original TV-friendly 1.33:1 aspect ratio. As I mentioned earlier, the re-enactment footage was shot on video for broadcast TV, and almost everything else is comprised of film clips and photos at least a century old -- even the on-screen graphics are fairly low-resolution. Dirt, debris, missing frames, judder, and other problems are still very much evident, but that's almost expected considering the source material. What shouldn't be expected are the obvious digital problems: edge enhancement, excessive digital noise reduction, and even a few moments of aliasing and ringing can easily be spotted all over this transfer. Detail is extremely soft in most cases, with many of the older photos displaying a waxy texture and boosted contrast levels. (I'm normally not one to care about bitrate, but it rarely exceeds 20 Mbps from start to finish.) Is it better than the DVD? Yes, but not by all that much. The optimist in me wants to say that this may the best The Indomitable Teddy Roosevelt will ever look on home video, at least for now, but the realist doesn't think it's a particularly good (or at least consistently good) effort. At the very least, maybe The Indomitable Teddy Roosevelt just wasn't an ideal candidate for Blu-ray. The DTS-HD Master Audio 5.1 mix is sourced from its original Chace Surround Stereo mix, and isn't totally discrete but at least employs a wider and slightly more balanced soundstage than the DVD. (One note - a 2.0 mix is advertised on the packaging, but is nowhere to be found.) Either way, a few familiar problems remain: George C. Scott's narration still fights for attention with the overbearing Sousa score: the former is anchored squarely in the center channel, while the score and other background moments and "dialogue" -- the re-enactment footage, added crowd noise, etc. -- are evenly divided between the other four with some presence in the center channel as well. At this point, it's obvious this problem is just part of the original mix, so I can't be too hard on it. As with the DVD, no optional subtitles are included. Very basic presentation here: the cover artwork is new and matches the basic but clean interface, which includes chapter selection and bonus feature access. No booklet is included, and this BD-R is packaged in a standard Blu-ray keepcase. It's factory sealed and not shrink-wrapped, if that matters. 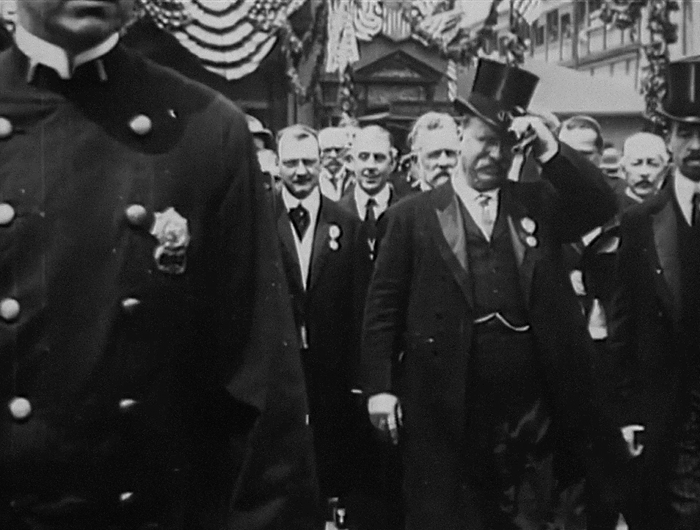 Only two extras from the 2010 DVD have been carried over: a brief Interview with director Harrison Engle (14:04) and a self-playing Transcript of Roosevelt's 1905 inaugural address. This means that all the other DVD extras -- mostly text-based, and nothing major -- have been dropped, including "Teddyisms" (famous quotes), a photo gallery, a Sousa biography, and an accompanying soundtrack CD. Harrison Engle's The Indomitable Teddy Roosevelt is an Emmy Award-winning documentary about one of America's best-loved Presidents; though it runs a bit short at 94 minutes, this George C. Scott-narrated production is loaded with historical footage and respectful reenactments. From T.R. 's early years through his untimely 1919 death, many of his greatest accomplishments are covered in modest detail. Flicker Alley's new manufactured-on-demand BD-R is sadly not much of an upgrade over Image Entertainment's 2010 DVD: the spotty A/V presentation is still very rough around the edges, and several old extras have been dropped as well. Add in the prospect of paying $20 or more for a burned-on-demand Blu-ray, and you've got a disc that will barely appeal to even the most die-hard fans. If that's not you, Skip It.